Someone requested these for the bakery and I sort of thought, meh…what’s the big with cherry almond scones. Holy crap you guys, these are my new favorite. Super simple to make. Everything’s a staple, none of this what’s-in-season crap. Pure heaven. Sometimes, by Sunday, when it’s the perfect scone-making day, my produce has dwindled and I don’t want to get out of my pajamas and go to the store. You know what I’m talking about? This is your scone for such a day. Yet, I don’t want to relegate her to just shut-in status. She’s truly a stunner and would equally merit placement on an elegant brunch table with friends. You can dress her up or down…she’s that scone. I take my scone-making seriously. But I think you know that by now. 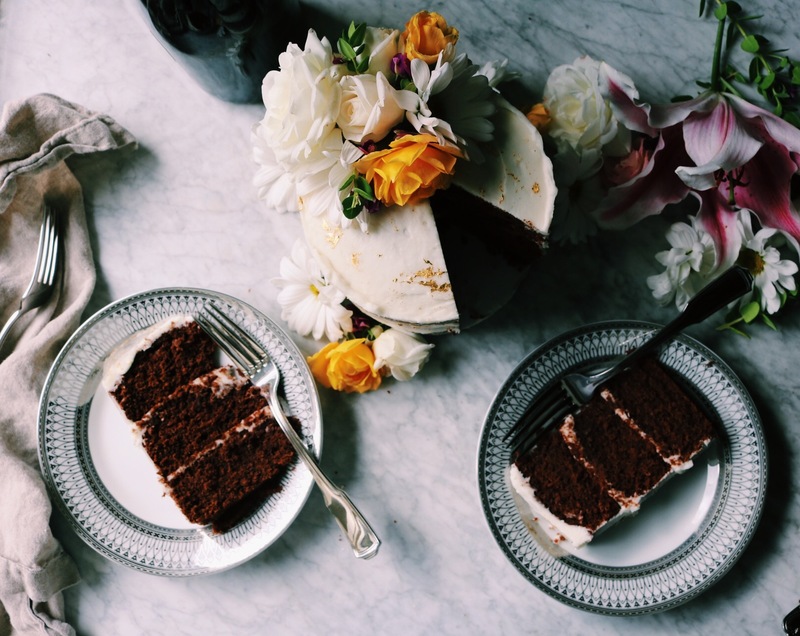 I’m dying to tell you that these are super moist, but I’ve recently noticed a trend away from the word ‘moist’ in regards to food. But, honestly, I want my scone moist. And this is a moist scone. Let’s say moist one more time. I can’t think of a better word? Can you? It’s Sunday and I’d like to get back to my pajamas, E! binge and the stack of magazines and cookbooks growing next to my bed. So let’s get to it. Make sure everything is cold. That means your cream, butter and egg need to be nice and chilly and spend minimal amount of time on the counter top. Don’t overwork your dough. Scones, like pie dough, are very sensitive to this. You want to maintain those nice pea-size butter chunks in the dough. Additional, the humidity really affects them. If it’s dry, you may have some flour bits on the bottom of the bowl while the scone dough is a nice and cohesive ball. However, if you are experiencing high humidity, you may have used up every last speck of flour and the dough still feels sticky. If it’s a low humidity day, no need to force all of the flour into the dough; if it’s humid as hell (hell is humid in this metaphor), you may need to take extra care to flour your hands for easier dough handling. When cutting your scones, do a quick up-and-down motion…no see-saw action. You want your scone sides to be crisp, 90-degree angles. 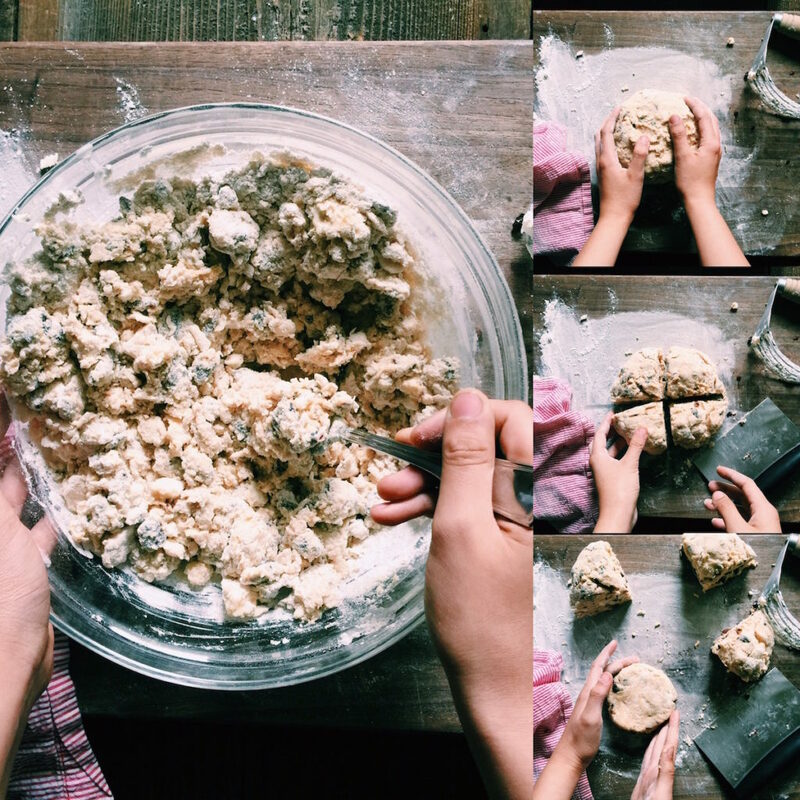 Let’s talk about my use of the freezer when baking…I use it when baking cookies and scones. It does several things…but most importantly it helps your scones get the best rise possible and hold their shape when baking. I wouldn’t skip this step. Be precise. With all of your measurements. I once tried to make scones at 1:30am, completely hammered, with a friend, and it was a disaster. Had I put that extra three tablespoons of flour in? Did you put the baking powder in? We ate them…but they weren’t pretty and they were kind of a disaster. So pay attention. Scones freeze like a dream. Seriously, this might be my most favorite thing about them. And this particular scone freezes like a champ. Make them all the way to Step 9 and pop them in the freezer. After an hour, they should have a pretty good freeze on. Gently wrap them in first parchment paper, then plastic wrap, then foil and lastly pop in a resealable plastic bag. This may seem excessive…but I want them to be perfectly preserved. When you’re ready to bake, simply unwrap and follow on to Step 10. In a large bowl, whisk together the cake flour, all-purpose flour, sugar, baking powder, cinnamon and sea salt. Cut the butter into the flour mixture using a pastry blender, two forks or your hands until this butter is about the size of peas. Work fast so that the pea-sized butter chunks don’t lose their chill. Toss the chopped cherries into the butter-flour mixture. Mix the 3/4 cup of whipping cream, egg, and almond extract together in a small bowl and then drizzle over the flour mixture. Using a fork, stir the dough until a craggy ball starts to form. Then I usually get in there with my hands to force the issue. If it looks like it could use a couple of kneads to form a ball of dough, I do that…but not too aggressively. Max out at about five-ish kneads. Line a cookie sheet with parchment paper or a silpat. Dust lightly with some flour. Likewise, dust a clean surface (such as a cutting board) lightly with flour and turn your dough onto that surface. Separate the dough into 4 equal size lumps. Each lump should be about 1/2 pound of dough. Gently pat each lump into a disc, about 1 ½ inches thick. Make sure your edges are sharp, 90-degree angles. Pop the discs, uncovered, into the freezer. Thirty minutes minimum and I wouldn’t recommend skipping this step. This will definitely make this dough easier to handle…especially when you’re trying to cut it. Likewise, it will help the scones rise up and not horizontally when baking. 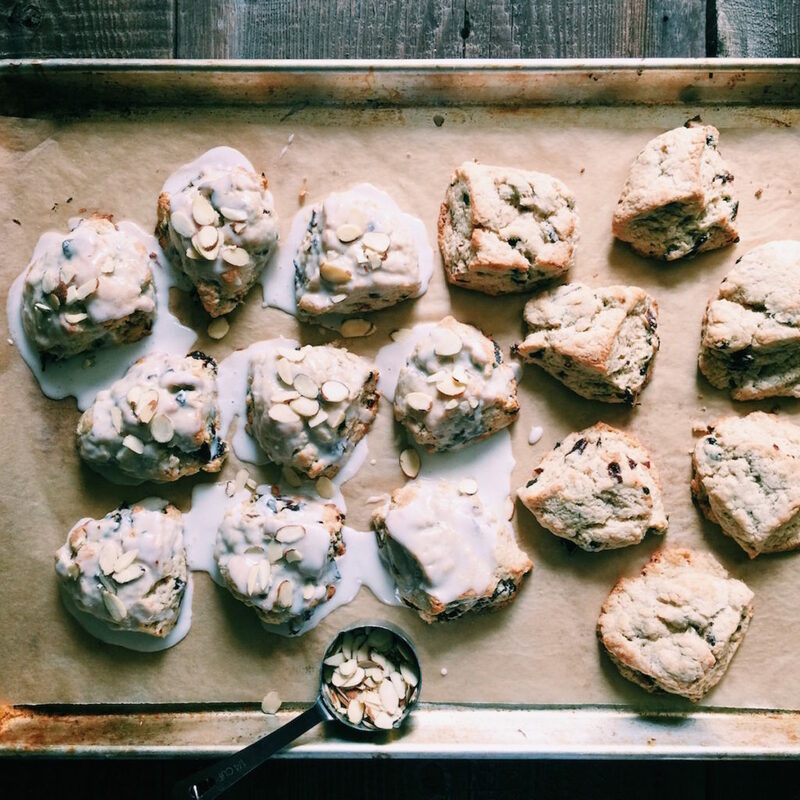 Put the cherry almond scones in the oven on the top rack and set the timer for 12-13 minutes. You want them to get a nice and golden tan in parts. Meanwhile…whip up the glaze in a medium bowl by mixing together your powdered sugar and almond extract. Add the milk, a teaspoon at a time, to thin the glaze to the desired consistency. 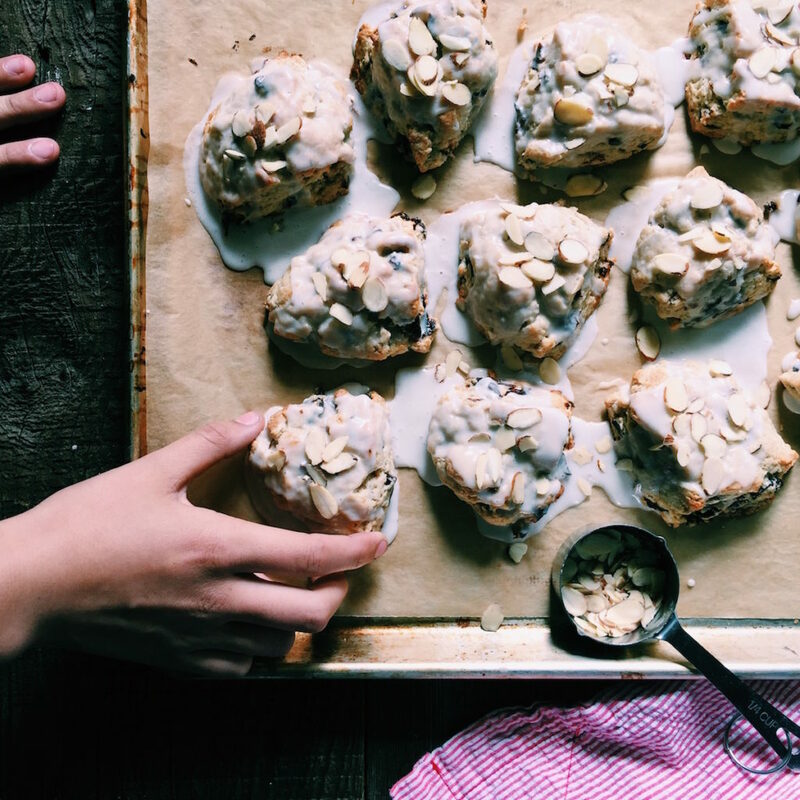 Let this sit and mingle while your cherry almond scones cool. 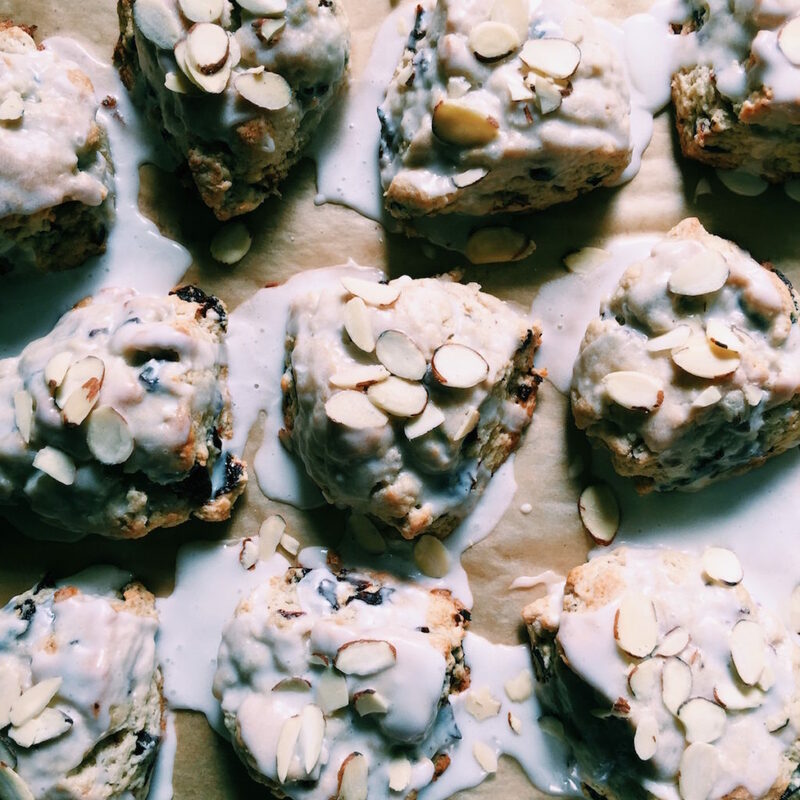 Drizzle the glaze over the cherry almond scones and immediately sprinkle with the almond slivers. Scones are best eaten the day they are made. However, they will last for a day or two if stored in an air-tight container at room temperature. More Scones: Blood Orange Scones, Gingerbread Scones; Cranberry Orange Scones; Maple Oat Scones; Pumpkin Scones; Thai Thai Scones; Bacon, Chive + Cheddar Scones; and Raspberry + Blueberry Scones. St. Patrick’s Day is coming up. Pretty excited about that. A lot of Irish coursing through my veins as noted by the pale skin, occasional ruddiness and love of whiskey. Last year I made this Corned Beef Recipe that includes next-day hash. I could eat corned beef hash all day e’ery day. I’m also working on a chocolate-rye-stout concoction. That last word is another on the do-not-use-with-food list. Whatever. I’m using it. Recently on DisplacedHousewife: Harissa Sliders with Feta-Harissa Secret Sauce, Brown Butter Muscovado Snickerdoodles, Gluten-Free Chocolate Chip Cookies, Double Chocolate + Banana Granola, Pecan-Crusted Goat Cheese Salad with Blood Orange Tahini Dressing, Braised Datil Chicken with Olives and Oranges, Fluffy Pancakes, Blood Orange Scones, Loaded Aloha Cookies and Chinese Buns. Have you guys been following the Piglet? I just bought the Hot Bread Kitchen and Bird in the Hand cookbooks. I was so so sad that Seven Spoons fell out so early. I love Ruth Riechl’s book….and PS, Gjelina is amazing. 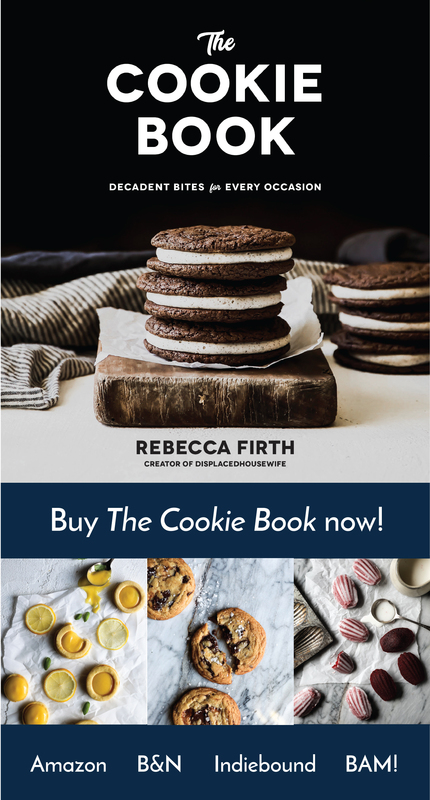 If you’re looking for cookbook recommendations. So my baguettes that I made from Tartine Bread came out gorgeous. Nice crisp crust. My only complaint was that you put the salt in when you do your first fold and I felt like it didn’t get evenly distributed in the dough…so some salty bites, some kind-of bland bites. Anyone know what I’m talking about? Tips? I love your scone recipes! I’ve had a lot of success and am looking to make more :) Do you think fresh cherries would work well in this recipe or should I stick with dried cherries? We have been into scones in our nest recently…we will try this yummy looking recipe next. Happy feasting. What a lovely idea to combined cherry and almond in a scone! They look beautiful. ooooh, these look so good. especially dripping with that glaze. i feel your sunday pain. i always have the same conflict on sunday…the frig is pretty desolate yet i can’t seem to drag myself off my cozy couch to go to the store. and god forbid i run into someone i know and have to interact. it’s all too much for a sunday. i much prefer your alternative by using what’s on hand. thanks for the inspiration! Totally gorgeous scones Rebecca! Love the flavors!! 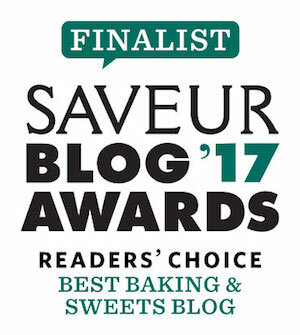 Awesome list of scone making tips too. Thanks. And hats off to Stella the hand model! These scones are gorgeous! After stalking your Insta the other day, I feel pretty confident calling you the scone queen. And one of these beauties is just what I need with my afternoon coffee! Laura!?!?! Shut the front door. Really? Cal Poly?!?! Completely small world. Are you still in California? I’ve been called the ‘scone lady’ but I’m thinking I much prefer ‘scone queen.’ Yes. That will do. Thank you for the nice words. 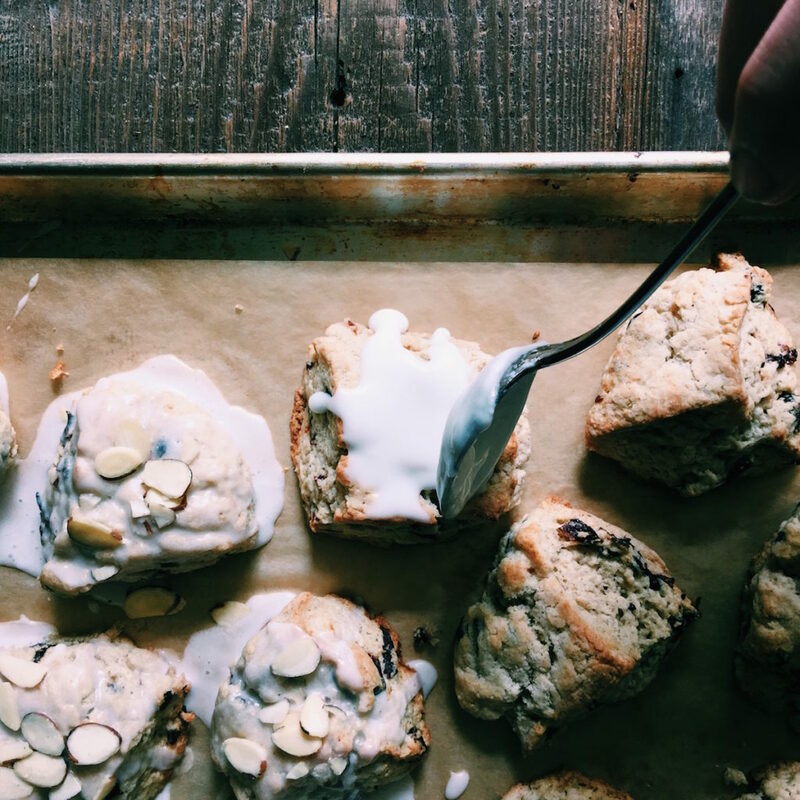 We are in love with these scones. I’m semi-scared because some are calling me from the kitchen as I type this. Yum!! These look so delicious! tender? delicate? but yeah, i get what you mean, there’s not quite a sub for moist. i love cherry and almond together, so i’m glad you didn’t totally dismiss the combo!